I’d never had to work Saturday’s before, but when I landed a job that involved doing my duty on the day God created for footballing purposes, I had to start to be a bit creative with my thinking. It was a challenge at times, but having a keen eye for ‘active diary management’, I could fairly easily turn the Saturday working hours from 9am until 4pm to 9am until 2pm. Suddenly through that simple but effective adjustment, my life had changed in one fell swoop. With the 2003-04 season upon us, on a red hot August Saturday afternoon I had concluded that your average customer would rather be out in the sun as opposed to being penned into an office with me waffling on about Trackers and Fixed Rates, so I quickly did a ‘flyer’ and made my way over to the Resource Centre in Dinnington, to watch Dinnington Town play Graham Street Prims. It was a boiling afternoon, the jacket and tie were jettisoned, but I still looked a bit out of place in a shirt and trousers when all around me were in shorts and t-shirts. I arrived a good fifteen minutes before kick off and was downing a pint pitch side when I felt a tap on the shoulder. I span round only to find our Financial Director and her husband, and guess what, they were ever so curious as to why I was at a football match in partial business dress, on a day when the business was operating until at least, err, half time? I managed to blag it up to a point, but it turned out we were both a little non-plussed as to why each of us was watching a Central Midlands League game at Dinnington? My response was quite a simple one, I explained I liked local football and I’d never been to Dinno before, the response I got back from the FD took me by surprise, it turned out she was on the league’s management committee and her husband took charge of the representative side. To cut a long story short, I inadvertently ended up on the selection committee for the representative team, albeit unofficially! My appearance at Dinno did not go unmentioned at work, but not in the sense that I had any explaining to do. I got an email from our Accounts Manager the following week who it turned out ran the unofficial website for Sheffield FC. He asked if I would write a few articles about the games I attended, which I did, and Mr X was born, which I guess was what started the writing bug, and why Bobbles Blog exists today! Visits to Dinno over the years have been sporadic, which is strange really because they have a pitch that seems to survive any weather conditions, I’ve turned up for games in the middle of monsoons and the pitch has been perfectly playable. The ground is also pretty tidy, and has seen quite a bit of development over the years, to a point now where it’s got three areas of cover, floodlights, and if you look very carefully, a bar, but you do have to look hard for it! The season I first visited, they finished runners up in the Supreme Division, which they did for three consecutive seasons before finally gaining admission to the Northern Counties East League. They won the First Division at the second attempt and then found themselves in the Premier Division. During that period they had a Dinno legend playing upfront, a lad called Liam Cartledge who scored goals for fun, but remained completely loyal to his home town club despite having the ability to play at a higher level. They finished eighth in the top flight in their first season but two years later they were to suffer relegation. 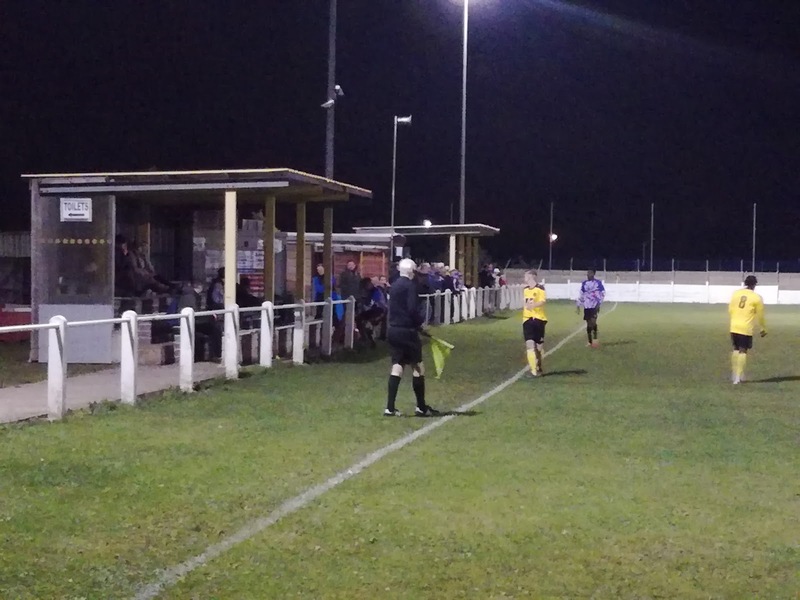 Three more seasons were spent in Division One, before the club withdrew from the league, re-formed as Dinnington Town 2014 and entered the Central Midlands League North Division. This is where we find them, and it’s not been easy, in the three years in the CML they have finished in the bottom three each time, conceding over 100 goals each time, but hopes are high that the club have now got some stability both on and off the pitch and are looking to move forward. 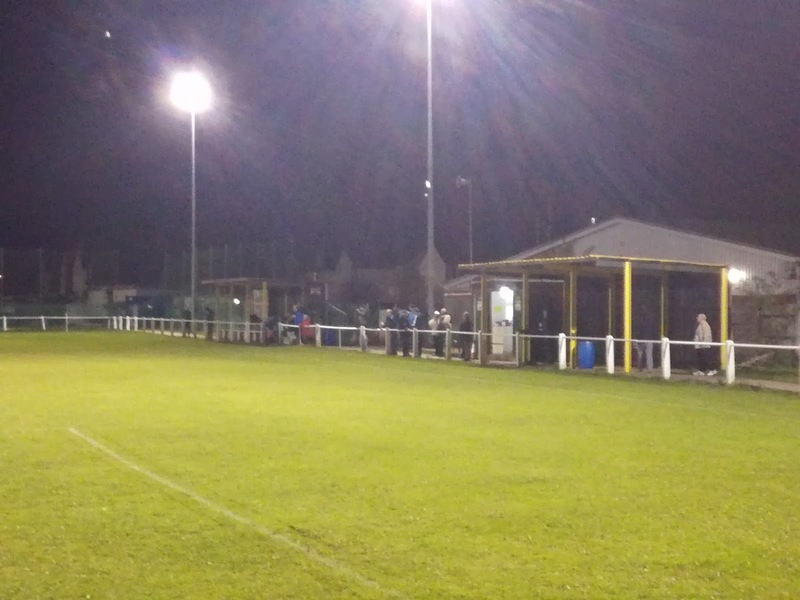 I understand former Belper Town goalkeeper and manager Andy Carney now owns the club but I could not see any evidence of that either at the ground or in the programme for the game against Collingham. There was a little sub-plot to this game. 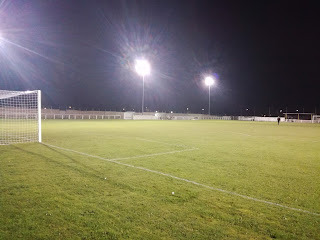 I took a call when I was en-route from a fellow blogger who had been at the Gedling Miners Welfare v Dunkirk game the previous Saturday. He had seen who was refereeing, and knew I was going to the game, so he decided to tell me what had taken place at Gedling. Turns out it had been somewhat controversial, and Scott Spering’s performance had come in for some heavy criticism, notably on the Gedling website. So not only was I watching a game tonight, I was also keeping an eye on the referee, he was not to disappoint! Collingham took the lead, and then grabbed a second just before half, which looked like being enough to take them into the next round. But then Dinno gained confidence and found their way back into the game in the 77th minute when Jacob France fired home from the edge of the box. 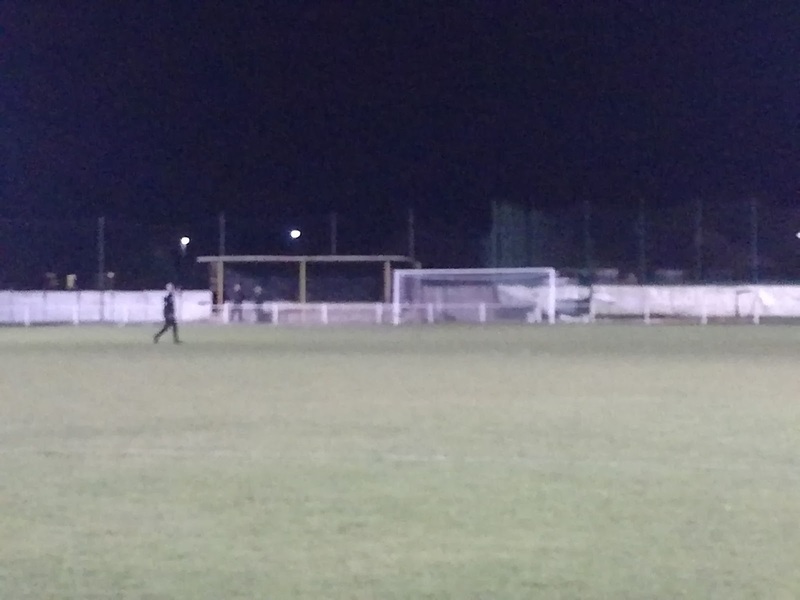 Dinno Assistant Manager Adam Pilgrim received his marching orders following an incident where the Collingham full back was alleged to have been a bit naughty, and with the clock moving into the 87th minute, France scored with a tap in and looked to have taken the game to extra-time. Then came the real controversy. Dinno were pressing forward, but a long ball caught them square, we were in something like the 95th minute. The striker raced forward on goal and lobbed the goalkeeper who had charged from his line. From where I was stood it looked as though the ball was going to just trickle the right side of the far goalpost, but then bizarrely a Collingham striker who was clearly offside and chasing the ball towards the goal, made the inexplicable decision to whack the ball into the net from a yard out. My heart sank, why? Extra time avoidance was in the bag and he does that, the flag was inevitable, or was it………? The linesman trotted back to the half way line, Mr Spering’s had little choice but to award the goal, Dinno went apoplectic, Manager Matt Jenkinson was dismissed from the dugout, Collingham chose to keep very quiet! 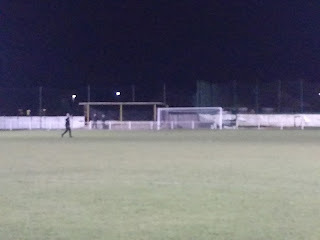 The final whistle blew moments later, I made a getaway, clearly something the officials would also have been keen to do. Dinno were furious and indeed gutted, but on a positive, they certainly don’t look like a bottom three side this season.